It resembles Daruma Daishi, the founder of Zen. It belongs to the family of sweet potatoes. renifolius refers to the kidney-shape of the flowers. In Japan, this form is more associated with the halo of a Buddha statue. And protected by this halo, Daruma sits quietly in Zen meditation ! Perennial growing to 0.5m. It is hardy to zone 4. 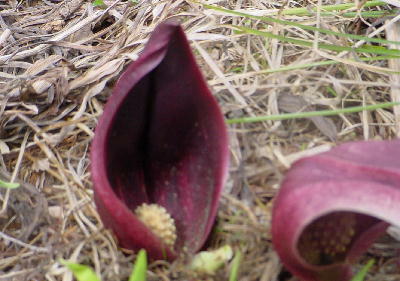 It is in flower from February to April, and the seeds ripen from August to September. 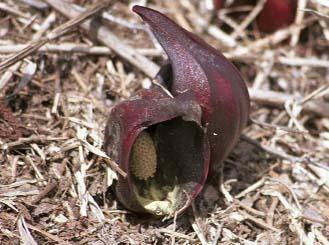 The scented flowers are hermaphrodite (have both male and female organs) and are pollinated by Insects. The plant prefers light (sandy), medium (loamy) and heavy (clay) soils. The plant prefers acid and neutral soils and can grow in very acid soil. It can grow in semi-shade (light woodland) or no shade. It requires moist or wet soil. Pathways for visitors, made of logs lead through many of the swamps of Japan. I love this one, Gabi. Beautiful photo of a gorgeous flower!